Charles Williams (?) 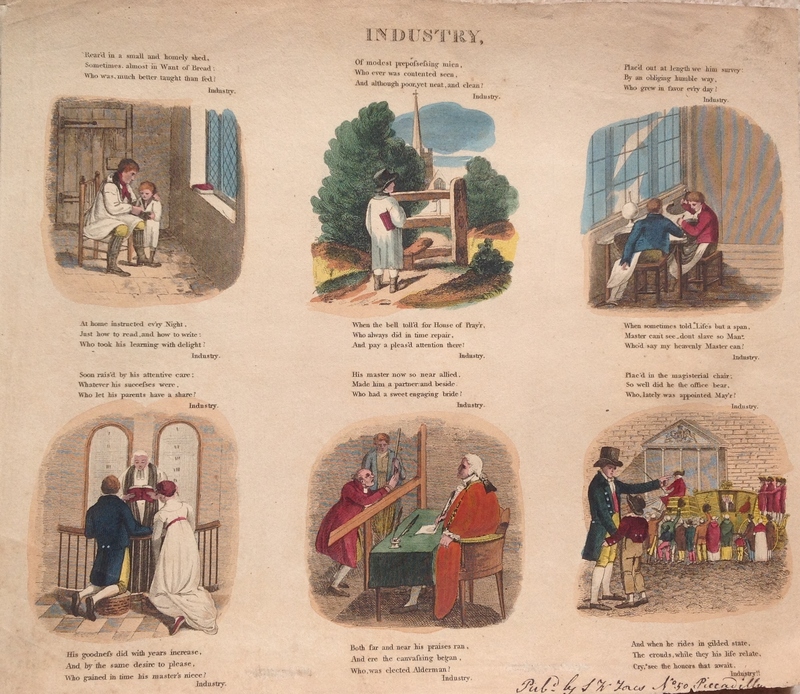 Industry & Idleness, Published by S.W. Fores (?) c.1820. Here we have a later and much amended version of William Hogarth’s Industry and Idleness series. Attribution is difficult as neither of the plates is signed or dated, the original publication lines having been replaced by a note in contemporary handwriting which reads “Pub’d by S.W. Fores, No. 50 Piccadilly”. The dealer who sold them to me had dated them to 1795 but the paper, use of letterpress text and clothing of the protagonists, all point to a publication date which is closer to 1820. The images themselves are not signed but the style of the engraving, particularly the use of heavy cross-hatching and slightly off-kilter body proportions, is close enough to that of Charles Williams to allow a tentative attribution to be made. Hogarth’s original version of Industry and Idleness tells the tale of two apprentice weavers, Francis Goodchild and Thomas Idle, who come from identical backgrounds but go on to take rapidly diverging roads through life in mid-eighteenth-century London. Goodchild serves as a rather sickening advertisement for the benefits of hard work and clean living, while poor Tom Idle’s life of gaming, whoring and petty crime is brought to an abrupt conclusion by the hangman’s noose. It is a solidly bourgeois morality tale, conveyed with all the subtlety of a sledgehammer blow and carefully calibrated to appeal to a newly emerging market of middle class consumers. It’s also arguably one of Hogarth’s most conservative works. The series conveniently avoids confronting the realities of a world in which talent and hard work counted for little in comparison with birth, wealth and connections, and at heart seeks only to encourage the poorer classes to obey their masters and accept their station in life. Fores’s version of Industry and Idleness deviates from the original in a number of important respects. Firstly, the twelve prints of the original series have been condensed down into a more cost-effective set of six images on two plates. 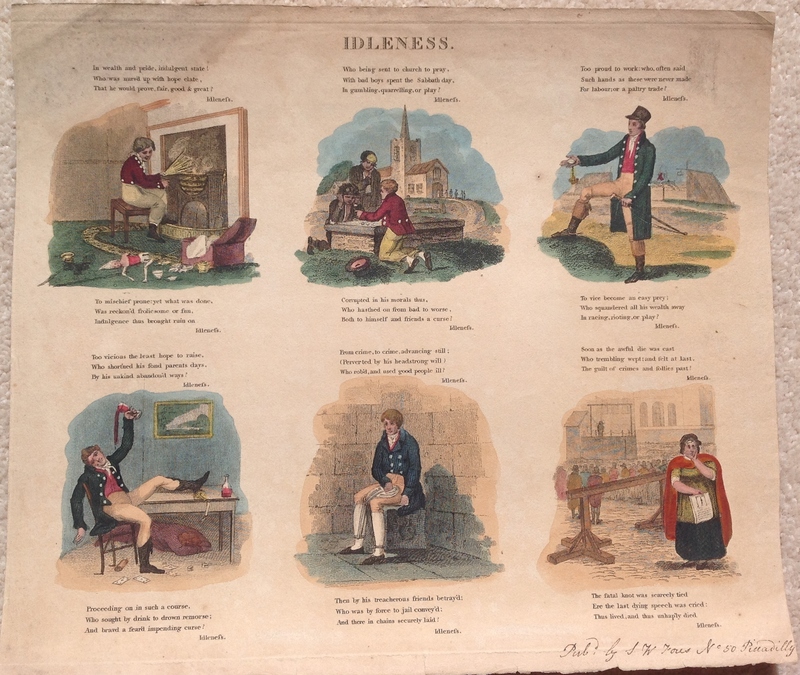 Secondly, the pictures are now accompanied by six lines of simple rhyme, reminiscent of that used in William Hone and George Cruikshank’s satirical pamphlets of 1819-1821. Thirdly and most importantly, the character of Tom Idle has been recast as an upper-class yob who squanders his fortune and brings ruin on himself. This change alters the whole tone of the story, giving it a far more satirical and subversive edge. While Hogarth’s Industry and Idleness encouraged middle class viewers to focus their attentions on their work and the church, Fores’s version invites them to contrast the standards by which they led their lives with those of the upper-classes who presumed to rule over them. In this respect the prints can perhaps be seen as part of the process which Vic Gatrell dubbed ‘the taming of the muse’, whereby the dour middle-class values of Victorian England gradually asserted themselves over the aristocratic libertinism of the earlier Georgian age. Charles Jameson Grant was a caricaturist and illustrator who briefly came to dominate the field of British graphic satire in the mid-1830s. 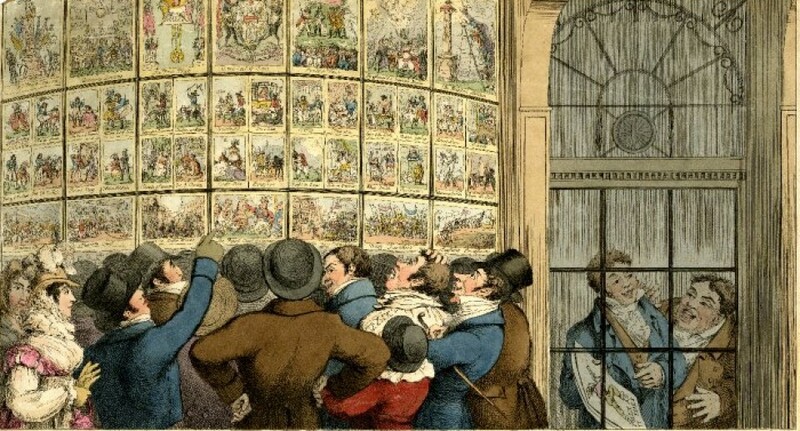 Grant excelled in a pungently radical form of political satire and demand for his prints soared in the years immediately following the passage of the Reform Act. By the time William Makepeace Thackeray came to write a review of working class political literature in 1838, he was horrified to find the “squinting eyes, wooden legs and pimpled noses” of Grant’s “outrageous caricatures” leering back at him from the pages of every pamphlet, print and newspaper he picked up. This fame was fleeting however and by the middle of the 1840s Grant was scratching a living on the margins of the publishing trade as a jobbing engraver and illustrator. His ultimate fates remains a mystery but the introduction to the catalogue that was produced to accompany a rare exhibition of his works at UCL in 1998, concludes with the rather sad assertion that he probably “came to a miserable and poverty-stricken end in Dicken’s London”. One of Grant’s most enduring and ambitious works was a series of 131 woodcut engraved political satires published between 1833 and 1835/6 under the collective title of The Political Drama. The sheer size of the series and the fact that it immediately preceded an explosion in the artist’s popularity, suggests that it was probably the most popular and commercially successful of all his works. So much so that the publisher B.D. Cousin’s made an attempt to launch a revamped version of The Political Drama in 1841. Like the original, this new version was issued weekly on cheap paper and priced at a penny. However the style of engravings differed significantly from primitive and anarchic woodcuts of the 1830s edition. Grant worked the woodblocks far more heavily, creating a much greater sense of depth to the images and giving them an aesthetic polish which had been absent from so many of his earlier works. As far as we can tell the second edition of The Political Drama was a commercial flop and surviving examples of prints from the series are now extremely rare. A copy of plate no. 3 was included in the catalogue for the C.J. Grant’s Political Drama, A Radical Satirist Rediscovered exhibition, and at that time it was unclear whether any further installments in the series had ever been published. The discovery of this copy of the plate no. 13 allows us to confirm that at least another ten plates must have been produced before the series finally folded sometime during the winter of 1841/2. Here Grant takes a swipe at the rapidly multiplying ranks of the royal family and bemoans the fact that Queen Victoria and Prince Albert seem determined to saddle the taxpayer with as many new mouths to feed as possible. It is not dated but the subject matter and its numbering strongly suggests that it was published sometime after the birth of Albert Edward, Prince of Wales and the future King Edward VII, on 9th November 1841. 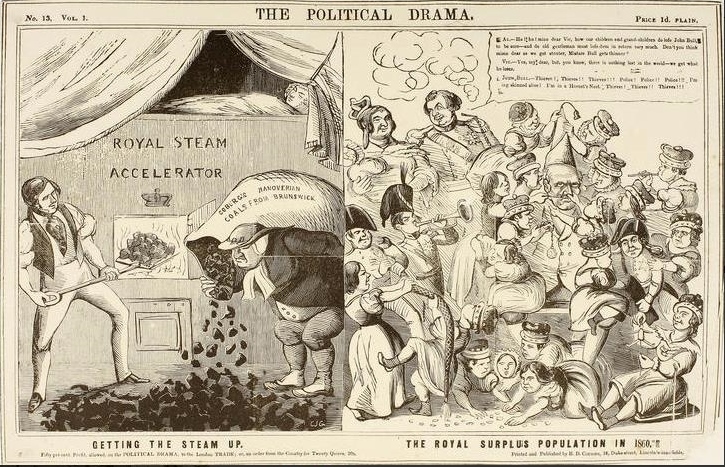 The image is split into two separate panels, the one on the left showing Prince Albert shoveling German coal into a raging fire which has been lit directly below the royal bed. While, on the right we see an older version of the royal couple contentedly beaming down upon a rampaging mob of princes and princesses. 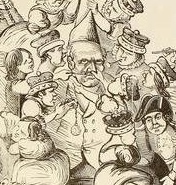 The children swarm all over the figure of John Bull (right), who rolls his eyes back in a look of barely suppressed fury, as the royal brats tweak his nose, scream in his ears and steal his pocket watch. Al. [bert]: Ha! Ha! mine dear Vic!, how our children and grand-children do lofe John Bull, to be sure – and de old gentleman must lofe dem in return vary much. Don’t you think mine dear as we get stouter, Mistare Bull gets thinner! Vic[toria]: Yes my dear, but, you know, there is nothing lost in the world – we get what he loses. John Bull: Thieves! Thieves!! Thieves!!! Police! Police!! Police!!! I’m [be]ing skinned alive! I’m a hornets nest! Thieves! Thieves!! Thieves!!! The print highlights the ways in which Grant had matured as a political satirist by this point. His anti-monarchical message would still have been considered radical in the context of mainstream British politics in the 1840s, but it is expressed in a far more subtle and humorous manner than many of his earlier designs. If the original editions of The Political Drama expressed a younger man’s anger at the inequities of the world, these later prints reflect something of the wry world-weariness of middle-age. This change may ultimately explain why Grant’s popularity was waning amongst a political print-buying public which was polarizing between the militant radicalism of the Chartist movement and Peel’s ‘one-nation’ conservatism – The latter continued to find him too radical in his outlook, while the former no longer found him radical enough.